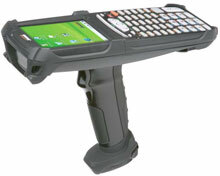 The Janam XG100 Series has been optimized to meet the unique requirements of mobile workers in warehouses, distribution centers, loading docks and other operating venues where rugged gun-shaped mobile computers are deployed. While its center-weighted ergonomic design makes it uniquely balanced and light, the Microsoft Windows-based XG100 is a powerful workhorse that delivers state-of-the-art computing performance in an exceptionally rugged package. Designed for the work at hand, the Janam XG100 delivers superior performance and flexibility at a great price. The Janam XG100W-1CGFBV00 is also known as Janam Technologies LLC	JAN-XG100W1CGFBV00	or XG100W1CGFBV00	.